The 128th birth anniversary of Bharat Ratna Dr Bhim Rao Ambedkar was celebrated at the State Legislative Assembly premises and followed by a programme at Chintan Bhawan on Sunday. The celebration was organised by social justice empowerment and welfare department in coordination with the All Sikkim Scheduled Caste Welfare Association. While Governor Ganga Prasad was present as the chief guest, chief minister Pawan Chamling attended the function as the guest of honour. The celebration started with offering of garlands and floral tribute to the statue of Dr Ambedkar by the Governor and chief minister here at the Sikkim Legislative Assembly premises. 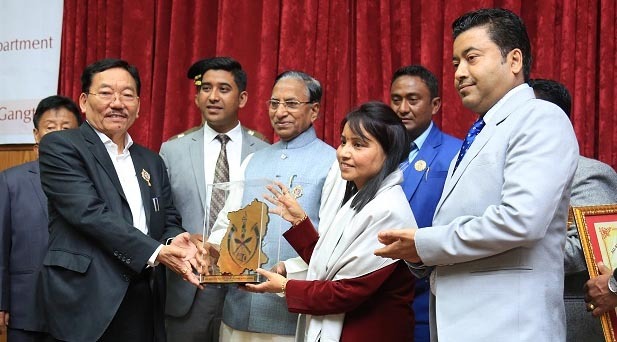 On the occasion, All Sikkim Scheduled Caste Welfare Association felicitated former minister Neeru Sewa for being the first woman minister from Scheduled Cast community and Nilesh Lamichanay for his achievement in the field of cricket. On the occasion, All Sikkim Scheduled Caste Welfare Association website – www.asscwa.org.comwas – was also launched by the Governor. In his address, the Governor spoke about the life and contributions of Dr. Ambedkar. He said Dr. Ambedkar led a number of social movements to secure human rights to the oppressed and depressed sections of the society and abolish cast discrimination and untouchability. He urged the gathering to follow the principles of Dr. Ambedkar in eradication of social inequality, bringing in human equality and liberation of minds to understand human reforms. The Governor asked the students to draw inspirations from his ideas and the action and activities should be aimed towards inclusive growth. Speaking on the occasion, chief minister Chamling asked the people to think beyond caste for the betterment of the state. He appreciated the organising committee for felicitating Neru Sewa and Nilesh Lamichanay and urged the youngsters, especially the students to take full advantage of the facilities provided by the government. He also advised the All Sikkim Scheduled Caste Welfare Association to open a Dalit Sahitya library to know the real meaning of their own history and culture. Chamling appealed to the gathering to bring a change in the society by following the principles laid down by Dr. Ambedkara nd and imbibe at least one principle of Baba Saheb in the life of their children. He said this would give moral satisfaction to the parents and would also enable the children to understand the importance of respect to elders and the society.